The first sign of tooth decay takes the form of small white dots that materialize just below the surface of the tooth enamel. These white spots are evidence that the attack of sugars and acids on your teeth are beginning to take a toll. At this stage, it is not too late to reverse the tooth decay through regular brushing, flossing and fluoride treatment. If tooth decay is not caught and reversed early on, it progresses further by attacking the surface enamel of your teeth. Teeth erode slowly from the underside outward, so the outer enamel will remain intact for the beginning half of this second stage. However, once the cavity breaks through the surface of the enamel, there is no turning back. A cavity caught at this stage must be corrected with a dental filling. At stage three, the cavity begins to erode the layer of tooth material that lies beneath the enamel: the dentin. You will likely notice if tooth decay progresses to this level because you probably feel some pain in your mouth. A dental filling can still be used to stop tooth decay from progressing past stage three and preventing the cavity from reaching the tooth’s inner-most layer: the pulp. The center of the tooth, beneath the layers of enamel and dentin, is made up of living connective tissues and cells called pulp. Once the cavity reaches the pulp, you will experience significant pain and discomfort. A root canal or a complete extraction are the only treatment options at this stage. After reaching the pulp, an infection then moves to the tip of the root and exits the tip of the tooth’s structure, infecting the surrounding tissues and possibly the bone structure. 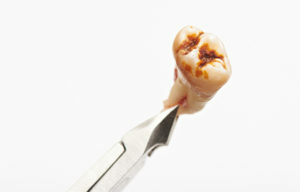 Swelling and severe pain are commonplace in the fifth and final stage of a cavity. If an abscess is not dealt with immediately, it can be fatal. Like in stage four, a root canal or extraction are the only remaining treatment options if tooth decay reaches this stage. Cavities do not develop overnight, but if tooth decay is not caught and treated in the early stages it can have serious negative impacts on your oral and overall health. Maintaining regular visits to the dentist is key to preventing and reversing the progression of tooth decay. Dr. Lyle Bonny has nearly 30 years of experience helping patients in Yakima care for their teeth and oral health. He works alongside the knowledgeable and friendly staff at Terrace Heights Dental Center to provide comprehensive dental services in a comfortable and welcoming environment. To learn more about tooth decay and how to prevent it, contact Dr. Bonny via his website or by calling the office at 509-248-4957.